What happens when you imagine emptiness; when you imagine that you have pitched, tossed, given your possessions permission to fly away until there is nothing left but elegant and luxurious emptiness? What happens when you imagine your home spectacularly bare? Three things I know for sure are that (1) possessions restrict movement; possessions weigh us down in numerous ways; (2) we don’t need much, and (3) possessions do not make us happy. …Possessions define us. We express ourselves, define ourselves, remind ourselves of our experiences and of our accomplishments; of other people in our lives and we even create a (false) sense of immorality through our possessions. Our possessions are representations of us. With that in mind, imagine emptiness; imagine that you have pitched, tossed, given the extraneous possessions, those things that no longer or never did represent the best parts of you permission to fly away. Imagine that there is nothing left but elegant, luxurious representations of you. What does that look like? 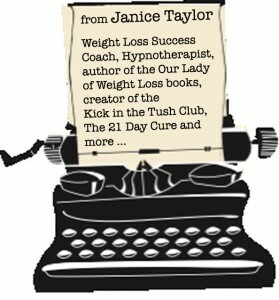 Can you stretch the imagining, the visioning to those extra pounds that no longer represent you? Can you imagine a new possibility? Share your imagining, your new possibility! Join Our Lady of Weight Loss’s KICK in the TUSH Club/FB!